The Aulani Hawaii Resort, in Kapolei, Hawaii, is a Disney owned and operated full-service resort. The resort offers nine restaurants, a full-service spa, salon, and fitness center, and luxury amenities for guests of all ages. They also provide more than 40 different sponsored activities. The guest accommodations at the Aulani Hawaii Resort come in a variety of different categories - resort rooms, villa, and suites. The resort rooms are categorized by the view that they offer. Guests can choose from Standard View, Island Gardens View, Poolside Gardens View, Partial Ocean View, and Ocean View. Each room has the choice of two queen beds or a king bed with a queen size sleeper sofa, and they sleep up to four guests at a time. The resort rooms come with many different luxury amenities. Guests are provided bathrobes for use while staying at Aulani, as well as a selection of bath products. Each bathroom also comes with a hairdryer and a shower/tub combination fit with a rain shower head. The rooms also include a ceiling fan, an in-room safe, a flat panel television with Blu-Ray player, a coffee maker with tea service, a mini fridge, and an iron with ironing board. For resort guests visiting with babies and small children, every resort room can also include a diaper disposal system, bed rails, outlet covers, a high chair, and a bottle warmer. Resort rooms also have their private balconies or porches. The villas have all of the amenities of the resort rooms with a few additional. Villas come with kitchenettes that include a stove, toaster, flatware, glassware, dinnerware, a microwave, a dishwasher, a full set of kitchen cabinets, pots and pans, a full-size fridge, and a washer and dryer. The suites offer the most amenities, adding in addition to the amenities included in the resort rooms an additional whirlpool tub, butler pantry, and multiple other flat-screen televisions. One other luxury amenity offered at Aulani is babysitting services. Babysitters will come right to each guest room, suite, or villa and watch children between the ages of 6 and 14 years old. There are nine different restaurant dining options for resort guests. For breakfast or dinner, guests can choose the Makahiki buffet. The Makahiki offers Character Dining and Character Breakfast on certain days. ‘Ama’Ama serves contemporary Hawaiian cuisine with table-service in an open-air environment, right on the Ko Olina Beach. For all-day dining while at the pool, guests can visit the Ulu Cafe. The menu includes poke bowls, hot meals, flatbread sandwiches, and other food easy to eat while on the go. Cocktails and small plate appetizers are served at the ‘Olelo Room. The Hawaiian language inspires the decor. Adults only are allowed at Wailana Pool Bar. The bar serves up cocktails and other adult beverages alongside classic lunch favorites. Off the Hook offers another poolside option, with sandwiches, salads, tropical beverages, and appetizers served in the fresh air. For guests looking for a quick bite while on the go, there is Mama’s Snack Shop. The walk-up shack offers fish and chips, coconut breaded shrimp, chicken tenders, and other easy to eat favorites. Papalua Shave Ice offers guests of all ages refreshing and fruity shaved ice desserts. Guests can choose their favorite of a wide variety of flavored syrup options. Finally, the beachside kiosk Little ‘Opihi has light meal options like sandwiches, salads, and other quickly prepared snacks. Room service also offers resort guests the opportunity to dine right in their rooms. Guests can choose from breakfast options like omelets, waffles, and pancakes, lunch options like soups and burgers, dinner options like steak and chicken, and dessert and beverage options as well. Each room phone has a button labeled “private dining” that guests can press to order. The resort has an in-house full-service fitness center, spa, and salon - Laniwai. The spa has dozens of therapies that have been specially designed for resort guests. The spa staff has signature therapies, massage therapies, herbal body remedies, and facials. They also offer services specifically for men and have packages for couples and families as well. The spa also runs the only outdoor hydrotherapy garden in the city of Oahu. The garden is 5000 square feet and has vitality pools and other amenities that come complimentary with the purchase of a spa treatment. Also, the spa also operates the Pulu Bar, which allows guests to mix their body polishes with a selection of natural herbs, essential oils, and other botanical ingredients. Those polishes can be used during treatment or taken home. The salon portion of the Laniwai spa focuses on the skin, nails, and hair. Guests can get a haircut, dye, or style, or enjoy a manicure and pedicure at the Painted Sky studio. The salon also offers packages catered just to male guests. Guests trying to stay in shape during a visit to Aulani can visit the Mikimiki Fitness Center. The center is open 24/7 and offers full service, state of the art fitness equipment for both cardio and strength training. Yoga and other fitness classes are available, as well as personalized training sessions. As a Disney owned and operated resort, Aulani offers many different guest activities. Overall, the resort has over 40 activities for the entire family to enjoy. Guests are encouraged to reach out to the front desk to inquire about specifics or to schedule an activity. Guests to the resort can golf at the nearby club - Ko Olina - which offers 18 holes on a championship course that is officially ranked by Golf Digest. Kids can golf free after 3 pm as well. There are a variety of pools and beaches for guests to enjoy while staying at the resort, which also includes grottos and splash zones. Each pool and beach were designed for children, although there are some adult only spaces as well. 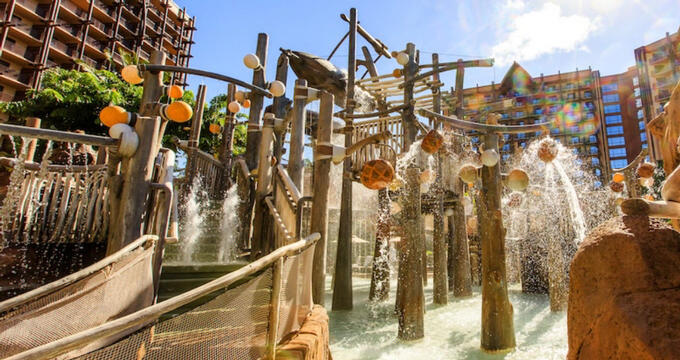 Children can participate in the Adventure Trail, which is a high-tech scavenger hunt that will lead them all through the resort to find specific items, solve riddles, and see what the resort has to offer. There are also many complementary activities at Aulani. Included with every guest stay at the resort are fire pit storytelling at Mo’Olelo, guided walking tours of Maka’Ik’I, crafts, and movies at the Pau Hana Room, and ukulele lessons by trained staff professionals. The resort has various gifts, Disney merchandise, sundries, and apparel for sale at one of their three different shops. Kalepa’s Store, located in the lobby of Aulani, offers guests the ability to purchase different vacation essentials. Guests can buy groceries, t-shirts, coffee mugs, and retro art both from Disney and from local artisans. For high-end merchandise, Hale Manu has a selection of goods, jewelry, and other gifts in a boutique setting. The store is also located in the lobby. For quick poolside take out snacks like chips and candy as well as island themed Disney apparel, the resort staffs The Lava Shack. Guests can also purchase sunscreen, beach towels, and pool toys.